Operator : Kangean Energy Indonesia Ltd. 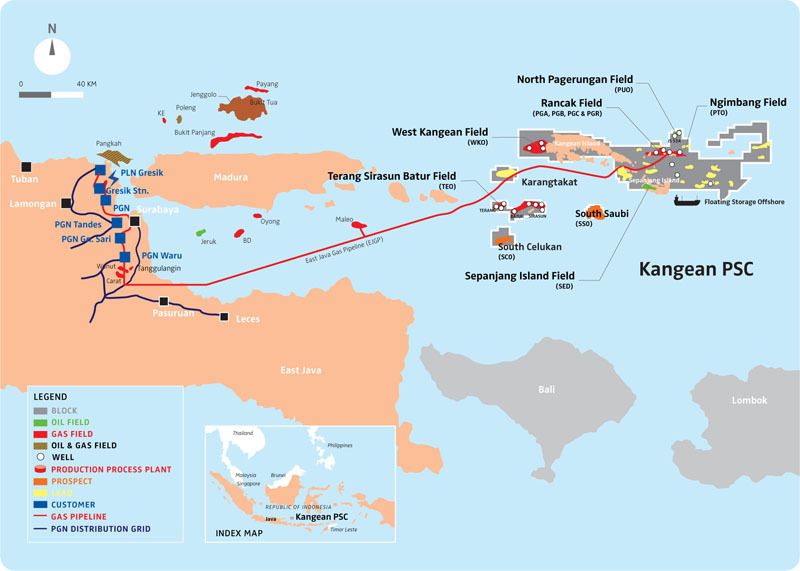 The Kangean Block is currently the largest discovery of gas made off the mainland East Java Coast, comprising both onshore island and offshore locations within an area in excess of 4,500 km2. EMP holds an effective interest of 50 per cent in the PSC with Mitsubishi and Japex each holding 25 per cent and all three represented on the operating committee. Japex is the nominated operator. Production is from 16 wells in the Ngimbang and Rancak gas reservoirs and the Sepanjang Oil field. The development efforts are focused on the large Terang Sirasun Batur gas field located about 20 km south of the Trans Java Gas Pipeline and 120 km north of Bali. Originally acquired as 100 per cent interest from BP in August 2004, the PSC was extended to 2030. Kangean has provided EMP with a significant gas footprint from which it continues to serve the rapidly growing industrial region of East Java. Together with its proximity to pipeline infrastructure, access to a large customer base, and large gas reserves, EMP believes Kangean represents a low risk development opportunity. The majority of this PSC’s reserves are proven and represent about two thirds of the company’s 2P reserve base.